Do you ever feel like Alice, lost and alone in a strange world, with no map to follow, and too many choices ahead of you? You may feel that even if you had a map, it wouldn’t help you much because you don’t quite know where you want to end up. All you know is that you want to get far away from where you currently are. You might ask yourself, what happens if I choose a path, but it turns out to be the wrong one? What if I can’t go back and start over? How do I choose the best path? How long will it take? How hard will it be? Will this decision lead to happiness? With so many choices in life, it’s easy to feel overwhelmed and then stay stuck where you are for fear of making the wrong choice. I’ve felt this way, stuck, confused and doubting myself, much more than I would like to admit. So believe me when I say that for the first time pretty much ever in my life, I am extremely excited that I finally have goals I wholeheartedly believe I will achieve. There’s just one little problem: I have absolutely NO idea what all it is going to take to get me there. Now you might be thinking, if you don’t know how you are going to get there, then what could possibly make you believe your goals are actually going to manifest? Well, that’s exactly what my initial thought was. In fact, that’s what my initial thought has been throughout my entire life, which is why I haven’t accomplished many of the things I want to. One of my biggest problems is that I’ve always wished for things. Every time I wished something would happen in my life, I would think to myself, “Just maybe, one day, by some crazy miracle, if I do enough good things for God, then just maybe he might let (insert dream) happen to me…” After wishing, I would immediately start trying to come up with a master plan of how to accomplish that dream. I would think about who I was and where I was currently at in my life, and then tried to envision who I wanted to be and where I wanted to be, and the gap seemed insurmountable. My mind would race far into the future, and since I didn’t instantly have answers on how to get there, I would quickly become depleted and think, “Yeah, that’s never going to happen. So much for wishful thinking…” I thought that because I couldn’t visualize the entire way, there must not be one. And guess what happened? Nothing! My dreams never came true because I gave up on them just as soon as they would come into my mind. I’d allow myself 30 seconds to try and come up with a life-plan, and would then wonder why everything always seemed impossible. I know this sounds ridiculous, but I continued doing time and time again. Thankfully, over the past year or so, I’ve finally come to accept something that has been absolutely life changing for me: I will never have all the answers right away, but I shouldn’t let that stop me from going forward and making them happen. So, as I mentioned previously, I finally have dreams that I know I will achieve, but I don’t know exactly how I’m going to get there just yet. One of my goals is to become an elementary teacher. While yes, I know the big things I need to do in order to accomplish this, such as student teaching this fall, applying for graduation, and earning my degree, I have NO idea where I will teach, what grade I will teach, or what it will be like to have my own classroom. I know I want to become a published author someday, and I really want to get a following going on my blog, but I don’t know exactly how to do these things, or what I want to write about just yet. I know I want to move out of state once I graduate, but I’m not exactly sure where or when, if I will move alone or with someone, or if it will be temporary or lifelong. Up until recently, I would’ve stopped right here. It would all be too much for my brain. Not already knowing each exact step I need to take to reach these goals would increase my anxiety to no end, and so I would shut the ideas down. Now, I’m learning to let go of control. I’ll be honest, I don’t know what the “best” decision is. I don’t know how exactly to get where I want to be. However, the beauty of this transitional point in my life is that it’s taught me that God will only let me know the steps when I need to know them, and no sooner. I can’t speed up His timing in my life. He doesn’t tell me because I’m just not ready yet, and that’s okay, because preparation is a process. So, He gives me glimpses of small details, one day at a time, at just the right time. I can look back at other times in my life when I felt so lost and confused, and had no idea what the future held, and He wasn’t telling me a thing. I begged and pleaded for more guidance and answers, but they didn’t come when I wanted them. Upon reflection, I now realize it was better that God didn’t give me all the answers when I wanted them. It’s likely that I would’ve quit early, because I know I would have been so worried about all the things I’ve had to do that anxiety used to tell me I couldn’t do. But as I continued to push myself, I got stronger day by day, and as I received God’s daily grace, I was able to do these things my anxiety told me were “impossible”, when the time came for me to do them. I won’t lie, right now it does feel like I have an overwhelming amount of choices. Which one is the RIGHT one? Which will lead me to the best life? 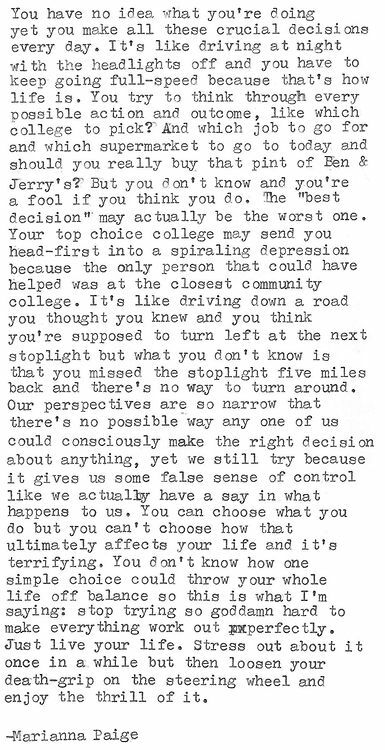 What if I make the wrong decision? Am I wasting my time? What if moving isn’t the right thing for me? The questions are endless! I must admit, I do not know, but I’m starting to think that’s the whole point. I’m starting to see this period of transition as a beautiful and exciting place to be. I get to create my own future. I am the master of my own fate. And you are too! How cool is that? I know deep within my soul that if I keep believing, am proactive with my goals, and do something everyday that pushes me toward them, no matter how small or seemingly insignificant in the grand scheme of things, I will get to where I am supposed to be. God will show me exactly what I am supposed to do, day by day, in each moment, as I continue to trust in Him. Since I have internalized this belief in my mind, it has been such a relief for me both mentally and physically. I no longer feel the urge to worry about what I will do in a year or two from now. I’m learning how to plan ahead, while simultaneously living in the moment, taking life one day at a time. The peace this new attitude toward life has brought me has been astounding and life-changing. I’ve learned the hard way that the only “wrong” or “bad” choice is making none at all! Staying stuck in what is safe and familiar, instead of venturing out to the unknown because you are afraid of what could go wrong, will never give you the life you want. While this was a difficult thing to learn, I am so glad that I did. Now I know that no matter which path I choose to follow, or which decisions I make, that I will end up where I’m supposed to. There is no way I could ever predict the outcomes of each path I could possibly take in my life anyway, so why bother worrying about them? I must keep moving, and release control to the one who it belongs to in the first place. Now, I am perfectly content to let Him take the driver’s seat, while I sit back and enjoy the journey on the way to where I am headed. On a final note, making life-altering decisions can be terrifying, or it can be absolutely amazing. It’s all up to you to decide. Which one will you choose? HEY KARA—! I ONCE TRIED TEACHING—NOW I’M A SECURITY GUARD WHO WRITES POETRY. GO FOR IT, KID! 🙂 LOVE YOUR TITLE!